Alpha-GPC benefits and side-effects | Does Alpha-GPC work? Alpha-GPC is the chemical precursor to acetylcholine, one of the human brain's most important neurotransmitters. In some clinical trials Alpha-GPC has been proven to help recovering stroke victims and Alzheimer's patients regain cognitive brain function and slow memory loss. Alpha-GPC is a choline compound found naturally in the human brain and in milk products. 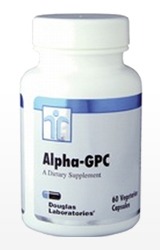 For the purposes of dietary supplementation, Alpha-GPC is synthesized from soy lecithin. Few side effects have been reported from taking Alpha-GPC. These include dizziness, headache, heartburn, confusion, and skin rash. It is widely believed that Alpha-GPC is safe to take in recommended doses. How Does Alpha-GPC Help Brain Function? Alpha-GPC works by helping choline cross the blood-brain barrier. This enhances the body's natural production of acetylcholine, an important neurotransmitter involved in neural processes such as memory and learning new information. Although Alpha-GPC has a number of benefits, we are quite satisfied with its scientifically proven benefits as a nervous system and brain revitalizer. Curious as to which brain supplements contain Alpha-GPC? Take a peek at our brain supplement reviews!